Some wildflowers attest to the truth of the Chinese proverb—“spring is sooner recognized by plants than men.” Even before winter has fully retreated, the impatient Yosemite bitterroot, Lewisia dispela, emerges from hibernation, seeking sunshine by extending its buds through the melting snowbanks. As the snow melts and saturates the sand, the delicate, white to rose-pink flowers sprout excitedly from the ground. Yet the eager plant experiences just a short burst of spring fever as the flowering lasts only two to three weeks before they wither. Two of my friends, both dedicated and passionate Yosemite Rangers, recently embarked on an excursion in search of the Yosemite bitterroot. Bob Roney has been in the park since 1968 and is a Master Interpretive Ranger (which means he’s one of the first people I ask when I have a natural or cultural history question) and the author of The Road Guide to Yosemite. Erik Westerlund has worked as a naturalist in Yosemite since 1992, and has turned me on to many of the park's not so obvious wonders with his enthusiasm, such as its dragonflies and newts. He also gets the award for most dedicated botany student, as he is known to carry An Illustrated Flora of Yosemite National Park—an eight pound hardcover book—on his backcountry hikes. Given the biological firepower between the two of them, perhaps it’s not surprising their mission for the ephemeral flowers proved to be successful. Once Bob posted a photo of the beautiful wildflower on Facebook, I had to contain my urge to immediately seek out the blossom myself. Embarking on a treasure hunt for these sublime blooms is one of my cherished rites of spring. 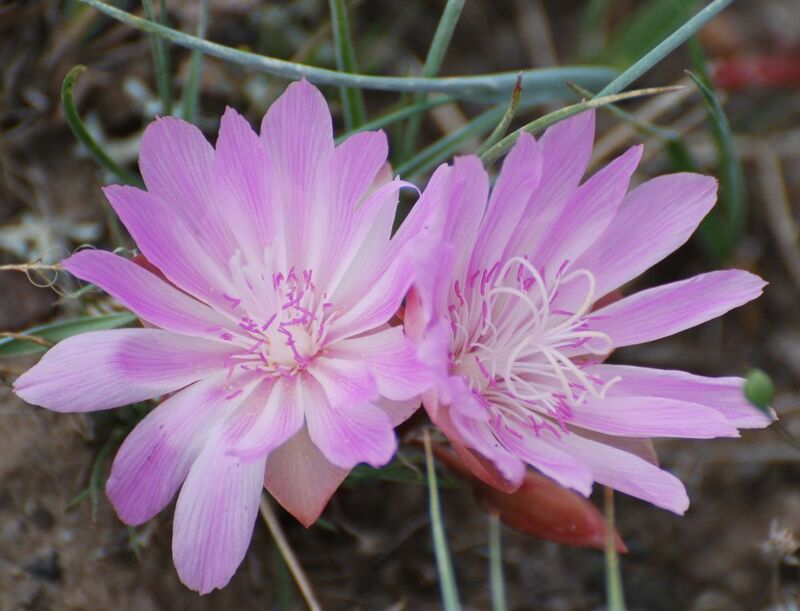 I’ve been fortunate enough to witness the flower in its granite garden many times in Yosemite, and when I lived in Yellowstone, gazed on its larger cousin, Montana’s state flower, the bitterroot Lewisia. The genus Lewisia honors Captain Lewis, of the Lewis and Clark expedition, who is generally credited with being the first to collect the flower. A reference in his journal is 1806 notes: "I met with a singular plant today in blume of which I preserved a specemine." So the next time you stand in Yosemite Valley in early spring, gaze up at the mighty granite walls and picture the tiny blooms of bitterroot, birthed from their rocky soil and melting snow, tiny jewels decorating the tops of these giants.